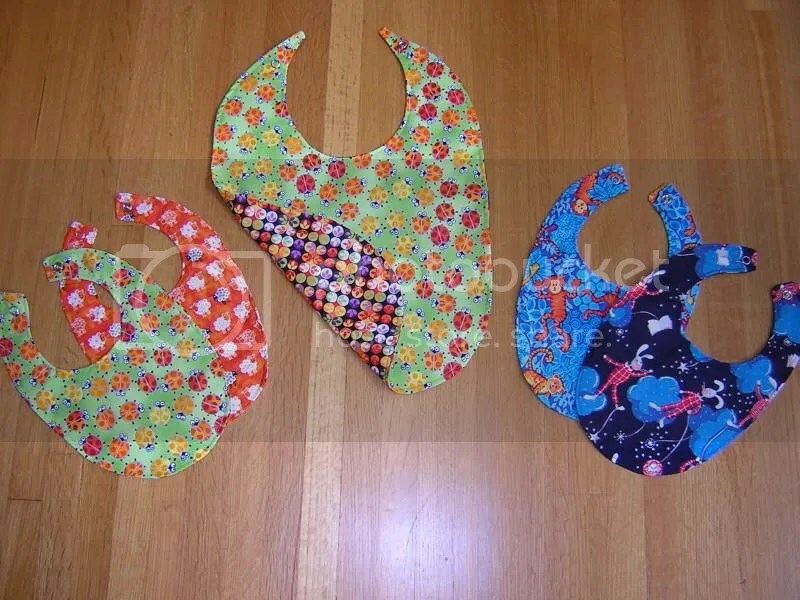 After the teacher tote bag sewing marathon, I was able to keep the momentum going long enough to finally make some bibs for babies who are probably 4-5 months old by now. If you must drool, you should look good doing it. From left to right- 2 bibs for a girl, a humongo bib for Gwen, and two bibs for a little boy in the UK. This boy is wearing a hat I made for his older brother but needs something just for him too. BTW, the teacher bags were a great success! The one who got the blue paisley shreiked when she saw it and said she needed it so bad. The one that has the black with leopard print threw it on her shoulder and started modeling. The one with the pink was the first to realize that they were hand made. This entry was posted on May 31, 2007 at 11:51 am and is filed under Uncategorized. You can follow any responses to this entry through the RSS 2.0 feed. You can leave a response, or trackback from your own site.